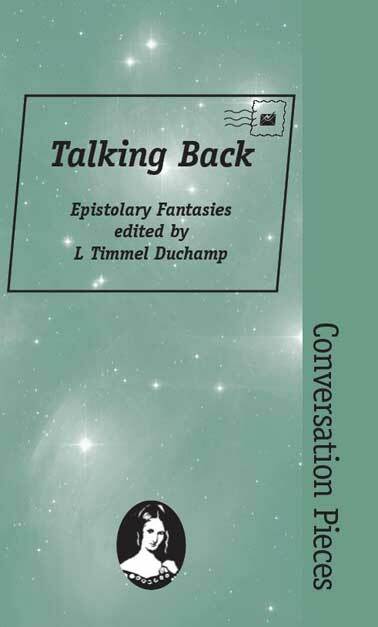 Talking Back showcases the epistolary fantasies of eighteen writers, among them Carol Emshwiller, Leslie What, Eileen Gunn, and Rosaleen Love. Invited to “talk back,” the authors penned love letters, fans letters, angry letters, thoughtful letters, letters to dead people, letters to fictional characters, letters to corporations. Carol Emshwiller writes to her beloved Ledoyt; Eileen Gunn, provoked by a New York Times review of Lady Windermere’s Fan, addresses Oscar Wilde; Heather Lindsley tenders friendly advice to Citibank; and Nisi Shawl explains to Jack Kerouac that the joke is on both of them. “Lovely Madame,” writes James Trimarco to Charles Dickens’s infamous Madame Defarge, “you whose eyes flash as your knitting needles click-clack at the table, I spit on the death your father has written for you and burn those pages from my book…” These are letters that will never be sent, intimate and personal, fantasies the authors have agreed to share with their readers.